Just a quick note here on meta to let everyone know we will be enforcing these six subjective question guidelines. This is just the title of each guideline; there's more detail about each guideline, with examples on the blog. Fair warning, any questions on programmers.se that do not meet a reasonable number of these guidelines (let's say roughly 4 out of 6) will be closed... aggressively. This question does not meet enough of our six guidelines for constructive subjective questions. This question does not meet enough of our six guidelines for constructive subjective questions. All questions should be practical, answerable, and of some educational value to the greater community. Chatty, open-ended discussion questions diminish the usefulness of our site and push other questions off the front page. and the official faq has been updated to reflect the above. ... now let the closings begin, for great justice. I've been grumbling about this for a while, so I've decided to try and post something constructive about this post and ask for clarifications that are not in the post or linked blog. You might argue that this isn't really an answer, but the post isn't really a question. I couldn't fit all this into a comment anyway! This list defines great subjective questions. What should we do about questions that are not "great"? I think it's fair to say that if a question met 2 or 3 of these criteria, it could still be good. I believe that being good should be enough to keep a question open. Being great should get it upvotes, unless it is now SE policy to only allow great questions. There should be a middle ground for a subjective question that merely gets it downvotes instead of close votes. Given that we do not yet know what the as-yet unposted answers are going to be like, shouldn't we give each and every question a fair kick of the can to actually see some of the answers before we close it? How long should that be? Agreed. But isn't this expected as a given for any SE question or answer, not just subjective ones? These two points really need to be combined as one, particularly if people are using a count of these guidelines as a reason for closing or downvoting a question. If you word a question to strictly follow the "experience" guideline, by definition you should not even need the "opinion" guideline, so it is impossible currently for a question to meet all six guidelines. invite sharing experience over opinions; if opinions are shared without experience, insist they are backed up with facts and references. Once the few joke and quote questions are gotten out of the way (and I think they have already), I'm not sure if there are many new questions that would really fall foul of this that wouldn't just be closed as off-topic, but I certainly could be wrong about that. OK, now it's clear that "trust the community" and "we don't rule SE, the community does" was just mouth rhetoric. If there's still some democracy on SE, we will be able to build our new place. The proposal has been CLOSED! People who think that we need some democracy, please vote to reopen. All questions must adhere to these guidelines. After reading the blog post, I understand the rationale behind enforcing #1. Subjective opinions are valuable to the community if they are based on experience, well-thought out reasoning, etc. Subjective rants or one-liners are not valuable. So a policy to avoid bad subjective questions makes sense. But enforcing #2 implies that all questions must be subjective. What is the first published reference to test-first programming? Where does the word "Programming" come from?? The first was closed as "not subjective enough". This makes no sense to me. How is this type of question detracting from the value of the site? From Wikipedia: "By definition, following a guideline is never mandatory..."
But, as evidence has shown: they're treated as rule or law. Don't fit the guidelines, get closed regardless of how many votes it has received or how many quality answers it has received (in some cases, both are true, an answer has been accepted and it's STILL been closed). As it stands, 2 (arguably 3) of the guidelines actually pertain to the question - that is 3, 6 (5). The rest are focused on answers (1, 2, 4). Judging questions based on answers is preposterous. Given a place where (I hope) difficult questions to answer are asked, there should be and will invariably be very poor answers. In high quantities even, from those who want to participate but lack the ability to do so adequately. Unless P.SE's goal is to grow into a fluff site, where only easily answered questions are asked, we should never judge the quality of a question by the answers it gets. That's what voting covers. I'm not arguing that this is the case currently (I wish it were), but I'm arguing that using these criteria to judge questions is flawed because the premises that they are based on is wrong. ... Q&A site for expert programmers interested in discussions that are only indirectly related to programming. If you don't want the site to exist, then get rid of it, that's perfectly reasonable but allowing it to go beta and public while attempting to hijack and derail its intent the whole way is just rude to those who contributed extensively to support it and help create it (via content). If you can't tell, I do want good, difficult to answer, entertaining, thought provoking, constructive questions. I do think that we need criteria that questions must usually meet. But these aren't those criteria. SE seems to be going more and more the way of forum-type questions. Just scanning across the questions a moment ago about 1 in 3 don't really belong here. Which are the best pickles for programmers? What should the next step in my career be? Why is language x better than language y? We will obviously have more subjective questions here than on SO, but it just seems to me that most of the questions break down to arguments rather than questions. For example, have a quick look to compare the number of comments (and their content) to SO. There's nothing wrong with programming forums, but SE isn't design to be that. Will these rules be applied to existing questions, or just to new ones? Specifically with regards to old, popular questions (Favorite Joke,What music do you code to, or Favorite Cartoon)? Edit: Ok, a few of these were addressed here, but what about existing question in general that don't meet the new guidelines? These are not guidelines, they pre-justifications for any moderator to arbitrarily close any question that bothers them or that they simple do not "like." They are completely subjective, open to wide interpretation, and just not suitable basis for rules and procedures of any community. They are so vague that they are practically meaningless. I think it's fair to say that anyone who believes that these "guidelines" are basis to fairly "enforce" anything is deluding themselves. This site is apparently 1/2 full of closed questions because we can't discuss anything that shouldn't already be on SO. Is there a different SE site I should be using or is are questions without one concrete answer beyond the scope of SE? There's no need to "close things aggressively". In evolution, genes aren't just deleted that seem bad -- because they actually may be highly specialized and simply do not apply in 99.9% of the cases. You need to think in terms of memetic evolution. It's silly to have heavy-handed moderation when you can just fix your voting model -- because it may be that 1/1000 question or answer that ACTUALLLY gives insight. 99.99999% of answers on SE/SO are irrelevant to 99.99999% of it's users. I know many sites deteriorate because they don't know how to do it, but SE/SO is halfway there. This is real value to the net because every community site has to solve this problem and develop the ideas to do it well. SE/SO could solve this by having too more buttons on their voting model. Besides up/down, they could have "move to top"/"drop to the bottom". Consider up and down double-chevrons for the symbol, like a tape recorder uses for fast-forward and rewind. Now, you'll have to figure out how to rank these votes from users so that quality questions don't sink because some newbie hits "drop to the bottom". You have to incorporate reputation. This is a solvable problem. I know because I've done it, on paper. I don't have a website to try it and I'm glad there a place like quora and SE that are implementing the net's solution to this problem. You just need to take it further. It's not a crime to admit that you don't know how. It's more of a crime to censor the community. Not the answer you're looking for? 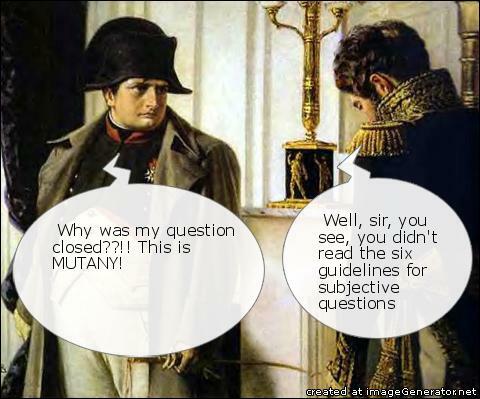 Browse other questions tagged discussion moderation subjective . What's the difference between Programmers and Stack Overflow? Are we Going down hill? How can we avoid Programmers.SE from becoming the SE black sheep? Change the name of Programmers to something that more accurately reflects the site scope? Would you like to see Programmers get a less playful/cartoonish design to attract professional questions? What can we do to help users understand our site better? Are “what did <person> mean” questions on topic?